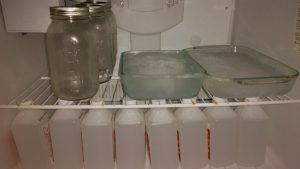 The first step is to put the isopropyl alcohol and cannabis in the freezer overnight, the colder the better. Freezing will make for a purer end product allowing for less chlorophyll and more resin extraction but is not necessary. Before extracting QWISO with stems, leaves, or buds, we need a container to do the wash in. I like to use a mason jar because it’s glass which means I can scrape dabs off and I can use the lid to hold the filter. 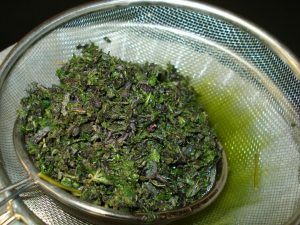 Breaking up the cannabis beforehand will allow for more surface area to come into contact with the iso but you don’t want to grind it too fine or you may end up with little pieces in your end product. If making QWISO with stems, I typically won’t grind or break them up. 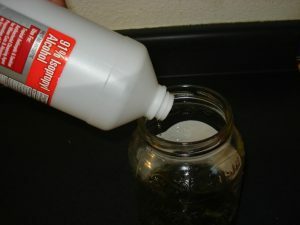 The next step is to pour the alcohol into the mason jar with the cannabis. The amount of time the alcohol is in contact with the cannabis is essential. The more time it’s in the jar the less potent your end product will be but the more you will get. Keep in mind that you can do this process multiple times with the same cannabis. I like to do 4 washes of 20 seconds each. The first batch will be the best and lightest in color and close to being a “QWISO Wax”. As you do more washes it will get darker and taste harsher. After each wash, pour the alcohol solution from the jar into the small pyrex dish while straining out the cannabis with the mesh screen. To further refine it, you can filter it with an unbleached coffee filter or cheesecloth but you will lose some product into it. Now that you have your QWISO solution, it’s time to purge it. You can just let it sit out in the open and wait for it to evaporate naturally but you’ll probably be waiting a day or two. That is why I like to put the small pyrex dish with the solution into a bigger one filled with hot water. Using hot water instead of direct heat is important because you don’t want any cannabinoids to evaporate or an open flame to set the alcohol on fire. 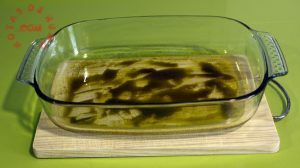 After the oil is solid and cannot be lit on fire with a lighter, you can scrape it out of the dish with a razor blade. The oil would still need to be decarboxylated to activate it for edibles... we do so in a tiny crock pot tilted to keep the oil in one corner to keep it from getting too hot. Once the tiny carbon bubbles stop appearing in the oil, decarboxylation is finished.